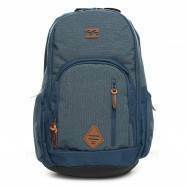 Billabong Backpacks - Billabong Atom School Pack - Ash Grey :: Men > Backpacks. All over bold floral printInternal laptop compartmentDimensions: (H) 45.5cm. (W) 30.5cm. (D) 15cmZipped pocket to front for additional storagePadded and adjustable shoulder straps for comfortable wearPadded back panel for supportDual zip fastening to main compartmentMen's backpackMaterial: 100% PolyesterDurable polyester constructionLogo tab to frontRubberised helmet loopGrab handle to top Size: one size.